Prehistoric dice boards found - Oldest games in Americas ? Prehistoric Dice Boards Found—Oldest Games in Americas? New theory for mysterious 5,000-year-old semicircles in Mexico. Mexico's Tarahumara used a scoreboard similar to older patterns at Tlacuachero site (1907 illustration). Potential gaming surface found at Mexico's Tlacuachero archaeological site. Photograph courtesy Barbara Voorhies. 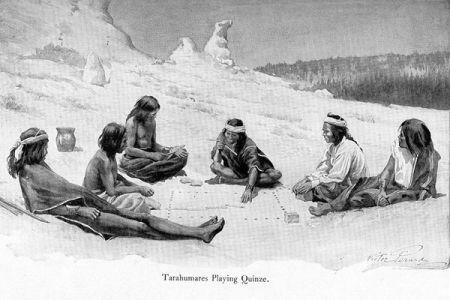 American Indian casinos aren't exactly new to the game—people were playing dice in the New World as early as 5,000 years ago, preliminary research suggests. Mysterious holes arranged in c shapes—punched into clay floors at the Tlacuachero archaeological site in Mexico's Chiapas state —may have been dice-game scoreboards, according to archaeologist Barbara Voorhies. If so, Voorhies added, the semicircles are the oldest known evidence of games in Mesoamerica, a region that stretches from Mexico to Costa Rica. Previously, the oldest known evidence of games in Mesoamerica was a 3,600-year-old ball court located not far from Chiapas. Voorhies first found one of the arcs in 1988, when she discovered a buried floor within a Chantuto shell mound, a large ancient pile of discarded seafood shells and other debris. The Chantuto people were foragers who lived along the coast of what is now southern Mexico between about 3,500 to 7,500 years ago. In 2009 she found another clay floor just below the first floor—as well as portions of nine other arcs. The upper floor has been radiocarbon dated to about 4,300 years ago, the lower to about 4,800 years ago. Finding the lower floor's holes reignited her decades-long search for an explanation of the patterns. 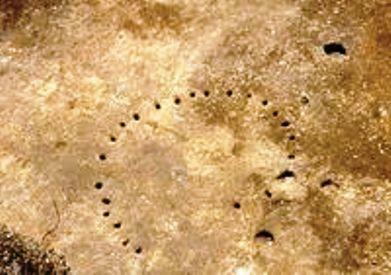 Later that year Voorhies found a historical account that revealed a "striking similarity" between the Chantuto holes and known native gaming boards—including those used by the Aztec in the 1500s and northern Mexico's Tarahumara in the 1800s. "There's no absolute proof that my interpretation of these strange features [is right], but it's a very strong analogy, and that's about as good as it gets for archaeology," said Voorhies, a professor emerita at the University of California, Santa Barbara. The arcs' resemblance to other native gaming boards is particularly convincing to John Johnson, curator of anthropology at the Santa Barbara Museum of Natural History in California. He agreed the patterns may be the oldest evidence of gaming in Mesoamerica, and even takes it a step further: "It looks to me like it's a very compelling argument for the earliest Indian gaming in the Americas—period," said Johnson, who wasn't involved in the research. The Chantuto people set up temporary fishing camps, collecting seafood from the wetlands and cooking it during large "clambakes," Voorhies said. After finding the strange hole patterns within the shell mound, Voorhies came up with various ideas about their purpose—for example, that they may have been marks left by the fenceposts of an animal pen. But once she'd read ethnographer Stewart Culin's 1907 book Games of the North American Indians, such theories became "preposterous." The Walapai dice board is made up of stones, not holes, arranged in a crescent. The Chantuto would have had no access to stones, which were scarce on the outer Mexican coast, Voorhies said. To play a game, two Walapai players would sit in front of the opening in the c created by the holes, Voorhies said. A player would throw a stick with one flat side—the Walapai "die." The flat and round sides each had a number value. Based on the number he or she had rolled, the player would move his or her stone (or other marker—it's not clear what the Walapai or Chantuto used) a certain number of spaces around the crescent. The person whose stone first reached the opposite end of the crescent would win the game. Dice Games Passed the Time? Prehistoric peoples such as the Chantuto had a lot of free time, Voorhies said. "It's tempting to imagine prehistoric men and women engaged in gaming during slack times while their fish, clams, and shrimp were drying in the sun," she wrote in a research summary. Her theory has not yet been published in a scientific journal. Robert Rosenswig, an anthropological archaeologist at the University at Albany, State University of New York, agreed it's a "plausible scenario." "What better thing to do when you're sitting around than to play some kind of game?" said Rosenswig, who studies prehistoric Mexican peoples and wasn't involved in Voorhies' research. "Gaming and gambling is important cross-culturally and a nearly universal aspect of a society, so I would be surprised if these people didn't gamble and play some kind of games." What's more, the discovery "fills in information about recreation, a whole other aspect of life that we know virtually nothing about for this earlier period," Rosenswig emphasized. That's because the Chantuto lived during the Archaic period, before the advent of ceramics and "bling"—such as jewelry—which can flesh out how a person lived, Voorhies said. Games—and gambling on their outcomes—have been widespread throughout Native American cultures for centuries, especially during "raucous" ceremonial gatherings, Voorhies noted. In general "Native Americans played gambling games to come into harmony with their universe," writer Kathryn Loving wrote in the 2003 book Gambling: Who Wins? Who Loses? For instance, games were thought to please the gods and thus increase fertility, cause rain, give or prolong life, expel demons, or cure sickness, among other benefits, according to Games of the North American Indians. So, as the Santa Barbara museum's Johnson pointed out, "the Indian casino thing, in a way, is not anything new—this has always been a popular activity." For example, games of chance, including betting, were often played by California native peoples prior to the Spanish arrival—which, in at least once case, gave the Indians an upper hand. In 1800 a missionary wrote about an incident involving a Spanish sailor whose ship was stationed at Santa Barbara. The missionary "got wind of something going on in one of the rooms," Johnson said, "and surprised an Indian, who was playing cards with one of the sailors on the ship." The Indian, Johnson said, "had won all the clothes off the sailor." Prehistoric People Made More "Real"
Of course, mysteries persist—especially the purpose of the large clay floors, which UC Santa Barbara's Voorhies doubts were built solely for games. A team of scientists is currently analyzing the clay's chemical contents, which may offer clues. Voorhies also hopes to find dice, though the pieces were likely made of wood and so wouldn't have survived the millennia, she said. Even so, the new theory has already changed how she sees the Chantuto. "I've spent a great deal of my life thinking about these particular people," she said. The unexpected insight into their amusements "makes them seem more real to me."